The season, from fall of 2003 through July 2004, was devoted largely to study of objects and architecture for publication under the supervision of the Fourth Ephoreia of Prehistoric and Classical Antiquities: Alexander Mantis and Panaiyota Kassimi. Staff: Elizabeth Gebhard, John Hayes, Alastar Jackson, Martha Risser, Jonathon Stevens, Stella Bouzaki, and Jean Perras. Notable identifications include joining sherds of fourteen vessels, some of which link the debris of the Archaic Temple that was left in situ with the repositories of temple refuse buried at the edges of the temenos. 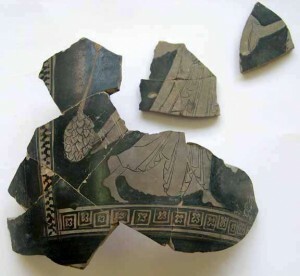 Significant in this group is a red-figured hydria (IP 350 and related fragments) with the scene of a striding maenad, swinging a thyrsos in one hand and an animal (hare?) in the other (Figure 1). The surface is heavily burned. Dionysiac iconography among Poseidon’s dedications occurs also in a bronze dedication depicting a dancing maenad. 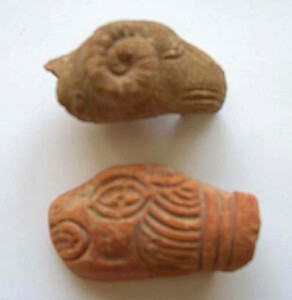 Both were found in the Archaic Temple. During study, photography and conservation of the iron and bronze weapons and armor it became clear that ostentatious display and ornament counted as much as military practicality. More than 400 fragments of helmets dedicated at Isthmia bore pins on the rim that had no practical function but were purely decorative and in fact weakened the rim. The latest identifiable piece of the collection comes from a “Thracian” or “Phrygian”-type of helmet belonging to ca. 470 B.C. or later. It supports the view that at Isthmia Greek dedications of arms and armor taken from other Greeks declined after the Persian Wars and ended before the mid-5th century B.C. Military dedications at Isthmia reach their peak in the second half of the 6th century B.C. 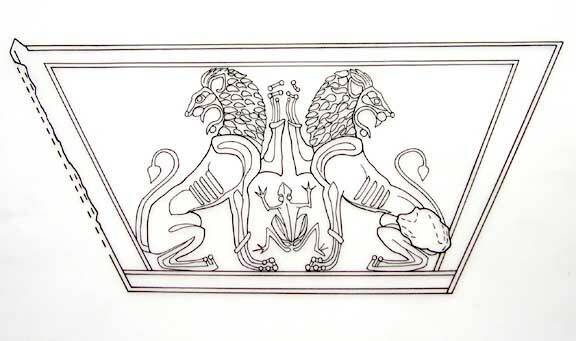 Figure 2 shows a shield decoration drawn by Karin Sotiriou. It was found that a few paterae, perhaps as early as the time of Claudius, were uncovered outside the sacrificial pits of the Palaimonion and may belong to the earliest cult activity in the Roman period. The vessels and lamps from Pits A-C begin ca. A.D. 50 and end in the second quarter of the 3rd century. The latest vessels in Pit C, masses of one-handled mugs accompanied by a large lamp of ca. 200 decorated with Cybele and Attis , suggest a change of emphasis in the final rituals. Possible signs of activity in the area of the cave above the theater in the late 4th and early 5th centuries were noted. In the western chamber of the cave a molded handle with ram’s-head terminal belonging to a terracotta patera of Athenian manufacture (mid or second half of the 4th century, IP 2281) was found with five lamps of similar date. A slightly later but similar handle (IP 2280) came from the surface of the theater below (Figure 3). Floors and associated deposits belonging to the western precinct of the Palaimonion during the 2nd century were identified (Phases III and V) and related to the existing masonry (Figure 4). Jonathon Stevens made sections and plans documenting their location as revealed during excavations in 1955-56. A sequence of walls in photographs of the 1956 excavations (B 108) may show that the large, ornamental gate at the north side of the Palaimonion was removed before the remodeling of Phase V in ca. 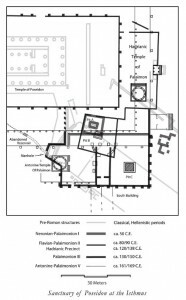 A.D. 161/168 and construction of the South Stoa. More indicative of the gate’s removal is the difference of about 1 m. between the stoa and the Palaimonion floor with no evidence of a stair. Study of the Classical stadium reservoir that was re-used as the adyton of Roman Palaimon revealed that only the eastern section, entered through the eastern manhole, was accessible in the early periods of the sanctuary to ca. A.D. 161/168. 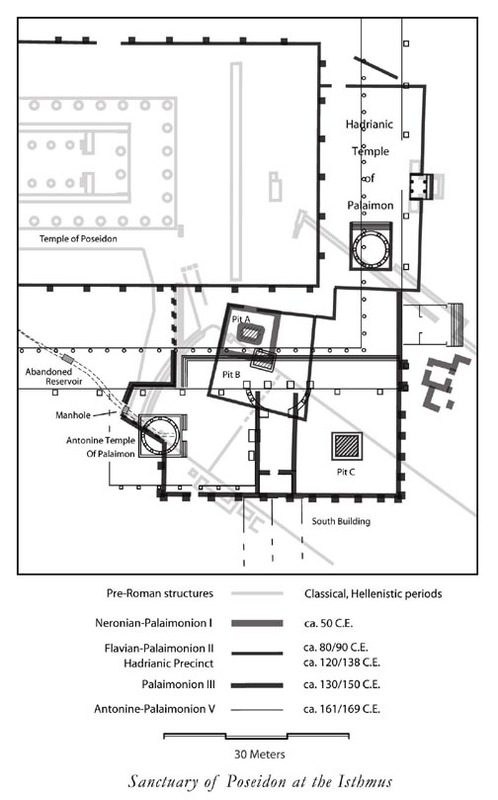 Opening of the entire underground reservoir and its connection to a doorway in the second temple (Phase V) may be an indication of changes in ritual. In connection with Joe Rife’s study of burials at Isthmia, we examined the Late Roman grave carved from the podium of the second Temple of Palaimon (Phase V). It appeared that the tomb was made after the superstructure and facing of the temple had been removed but before the final destruction of the Palaimonion in the late 5th or early 6th century. The bare surface of the concrete podium probably would have been visible above ground and may have suggested itself as a suitable grave site. Working in close cooperation with A. Jackson, Mrs. Bouzakis cleaned and conserved over 80 iron weapons and projectile points. 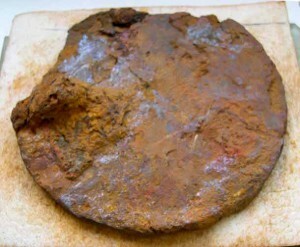 The difficult cleaning of an iron discus, one of the few surviving examples from the archaic period, neared completion (Figure 5). The remaining plaster covering the inside surface of the south wall of the Palaimonion precinct (Phase V) was conserved. Microscopic inspection revealed no traces of pigment. Figure 1. Red-figured hydria with the scene of a striding maenad, swinging a thyrsos in one hand and an animal (hare?) in the other. Figure 2. Shield decoration drawn by Karin Sotiriou. Figure 3. Mold-made lamp handles. Figure 4. The Palaimonion during the 2nd century.